Secret Terrible Hobbit Post – Good Times Ahoy! This is the third, final, and long-awaited post about The Hobbit: The Desolation of Smaug. In this post, we pick apart the problems with the part of this wretched trainwreck that involved its titular character (no, not Bilbo; this movie isn’t about Bilbo): Smaug. We’ll also explore the fact that Peter Jackson has no idea how science works. I have to admit, the Smaug part of this movie starts out great. I’m definitely way less CGI-picky than some people I know (*cough* Tom *cough*), but I’m pretty confident in saying that this is a mighty fine piece of dragon work. And of course, Benedict Cumberbatch’s voice is perfectly menacing. This is also one of the few times in the movie where we get to see Bilbo, which is always a plus. And then things just get silly. In a flash of Eye-of-Sauron stupidity, Bilbo takes off the Ring again, exposing himself to an enemy not only dangerous, but also evil. I can’t be sure, but in the book, I’ll bet a main reason Smaug lets Bilbo live long enough to have an extended conversation (after he previously went on a pony-killing spree because Bilbo stole some treasure, I might add) is that Smaug is intrigued by the fact that he can’t see Bilbo, though he can smell him well enough to know more-or-less where he is. Smaug has leveled cities and slaughtered men, women, and children without batting an eye, Bilbo. What makes you think you can talk your way out of this, while perfectly visible and unprotected? Well, I guess in Peter Jackson world, he absolutely can. Because in Peter Jackson world, Smaug is a pansy. Really? “Behind you!”? That’s all it takes to call Smaug the Magnificent off the hunt? Look, dragon, Thorin Oakenshield and the Barrel-riding chump with the magic ring are right in front of you. Take care of them first, then go after the laughable distraction. It’s really not that difficult. I thought a dragon always went for the kill! Never mind, that line is from a real dragon movie. At this point, none of the rest of the movie makes any sense, because none of the rest of the movie should be happening. In the book, where Smaug is actually threatening, the dwarves know that engaging the dragon would mean certain death; consequently, they do not engage the dragon. Bilbo finishes getting information from Smaug, high-tails it out of there (chased by actual dragon fire), and meets back up with the dwarves. Smaug broods for awhile, decides to attack Lake-town, and destroys the entrance to the mountain, trapping the dwarves inside the cave. That’s it—end of Smaug, as far as Thorin and Co. are concerned. And then, Elbereth help us, comes the wheelbarrow sequence. At this point in the movie, I was done. I’d had it. Peter Jackson had effectively booted me out of the craptastic world he’s created, and left me sitting in the movie theater wondering where I went wrong. Anyone with the most basic understanding of physics (e. g. hot things make other things hot when they’re touching) should consider this scene extremely surreal. Then again, Peter Jackson was a high school dropout who spent all his time watching movies, so what can we expect? But still, someone on the production team should have realized that floating on a metal wheelbarrow down a river of molten gold makes absolutely no sense. The melting point of gold is 1,948 degrees Fahrenheit. The wheelbarrow is pretty small compared with the amount of gold flowing around it, so it’ll reach that temperature pretty quickly. That means Thorin is holding onto an almost 2,ooo-degree wheelbarrow with his bare hands. Now, I’m pretty sure dwarves were created with some heat resistance that humans and Elves don’t possess, but all heat-resistant materials have their limits, and I’m having a hard time believing that 2,000-degree steel is within those of a living dwarf. Thorin should be dead/on fire, not calmly floating off to fulfill his destiny. A recent annual gold survey estimates that all the gold ever refined would make up a cube 68 feet on each side. 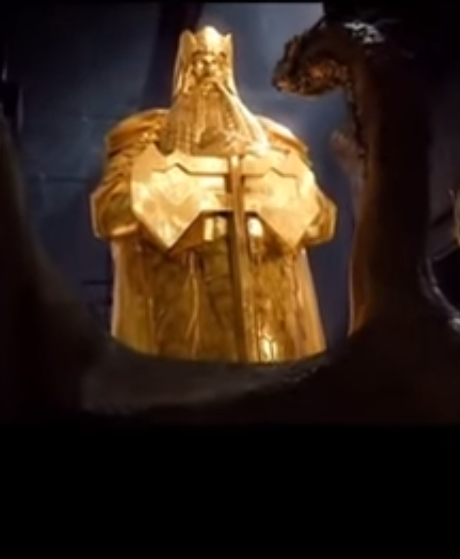 This article (which does some great analysis of the unrealistic metallurgy in this movie, and should be read by everyone) models this statue as a cylinder 49 feet high with a 16-foot diameter. This statue represents 3% of the present-day world’s gold, and none of it comes from Smaug’s horde, as far as I could tell. I’m calling bad science. Nice points! I don’t think I’ll be rushing to see this movie again anytime soon. Oh, and hi! I can’t resist a good scavenger hunt. 🙂 I’m a friend of Natalie, Tom’s sister. Hello! Nice to meet you, friend of Natalie. 🙂 Hey, if you’re interested in the “prize,” send your address to elissa.nysetvold@gmail.com.